I am constantly frustrated if the axis are identical why do the charts say different things? In your first chart, movement forward in time is left-to-right, but in your second chart movement forward in time is right-to-left. The advantage of the second chart is that it displays the forward curve as it might appear from the perspective of today; backwardation = decreasing forward curve. 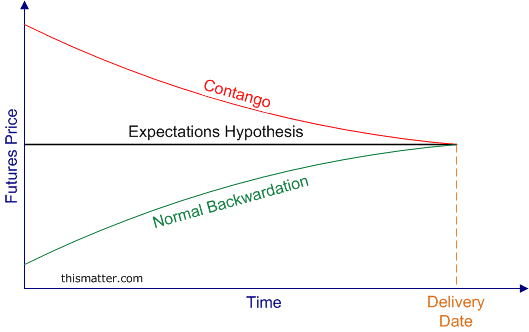 Some more theory here https://www.bionicturtle.com/forum/threads/contango-backwardation-and-trading-cheap.10654/ (including we have tags e.g., https://www.bionicturtle.com/forum/tags/contango/). I hope that's helpful!